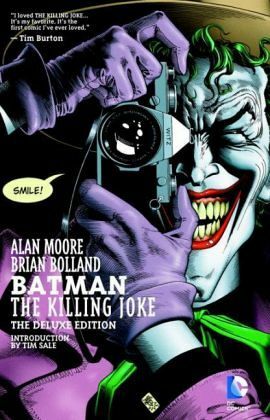 A NEW YORK TIMES BESTSELLER Presented for the first time with stark, stunning new coloring by Bolland, BATMAN: THE KILLING JOKE is Alan Moore's unforgettable meditation on the razor-thin line between sanity and insanity, heroism and villainy, comedy and tragedy. According to the grinning engine of madness and mayhem known as The Joker, that's all that separates the sane from the psychotic. Freed once again from the confines of Arkham Asylum, he's out to prove his deranged point. And he's going to use Gotham City's top cop, Commissioner Jim Gordon, and his brilliant and beautiful daughter Barbara to do it. Now Batman must race to stop his archnemesis before his reign of terror claims two of the Dark Knight's closest friends. Can he finally put an end to the cycle of bloodlust and lunacy that links these two iconic foes before it leads to its fatal conclusion? And as the horrifying origin of the Clown Prince of Crime is finally revealed, will the thin line that separates Batman's nobility and The Joker's insanity snap once and for all? Legendary writer Alan Moore redefined the super-hero with WATCHMEN and V FOR VENDETTA. In BATMAN: THE KILLING JOKE, he takes on the origin of comics' greatest super-villain, The Joker -and changes Batman's world forever. Stunningly illustrated, BATMAN: THE KILLING JOKE, THE DELUXE EDITION has been lushly re-colored by artist Brian Bolland, presenting his original vision of this modern classic for the first time. Alan Moore, geboren 1952 in England, begann seine Karriere Ende der 70er Jahre als Strip-Autor und-Zeichner für "Sounds". In den frühen 80er Jahren konzentrierte er sich aufs Schreiben und veröffentlichte u. a. für die britischen Magazine '2000 AD' und 'Warrior'. Seine Verlagsarbeiten machten ihn zu einem sehr populären Comic-Autor. 1996 erste Romanveröffentlichung. Auszeichnungen mit fast allen Preisen für einen 'Comic'-Autor sowie mit dem Max-und Moritz-Preis als bester Szenarist. 2008 erhielt Alan Moore den Max und Moritz-Preis als Sonderpreis für sein Lebenswerk. Der Autor lebt in Mittelengland. Eine der bedeutendsten Batman- bzw. Joker-Geschichten von Alan Moore, die die vll. bekannteste Origin-Story des "Clown Prince of Crime" enthält und uns mit der Frage konfrontiert, was die Fledermaus und ihren Erzfeind eigentlich unterscheidet bzw. was es braucht, um aus einem normalen Menschen einen Verbrecher zu machen. Tolle Charakterzeichnung, geniale Artworks und eine fantastische Story - nicht nur für Comic- oder Batman-Fans ein Muss, sondern für jeden, der brillantes Writing zu schätzen weiß!